On the pictures of the FT232RL on the web site, a few people (including myself) had a little trouble seeing the solder jumper. It was easy to locate it once I had bought the board, but it would be nice if there were a zoomed-in photo showing exactly where it is. I'm posting this picture so that hopefully anybody who is considering buying this can see exactly what needs to be unsoldered. After unsoldering the jumper, you can change the I/O voltage. The wiring, as shown in the photo, does two things. The wires to GND and VCC make the FT232RL board a +5V power supply for the breadboard, and the wires from VCCIO to VCC make the TX/RX signals +5V. I'm guessing this is the configuration that many people are looking for. Hey 60amp_relay - thank you very much! 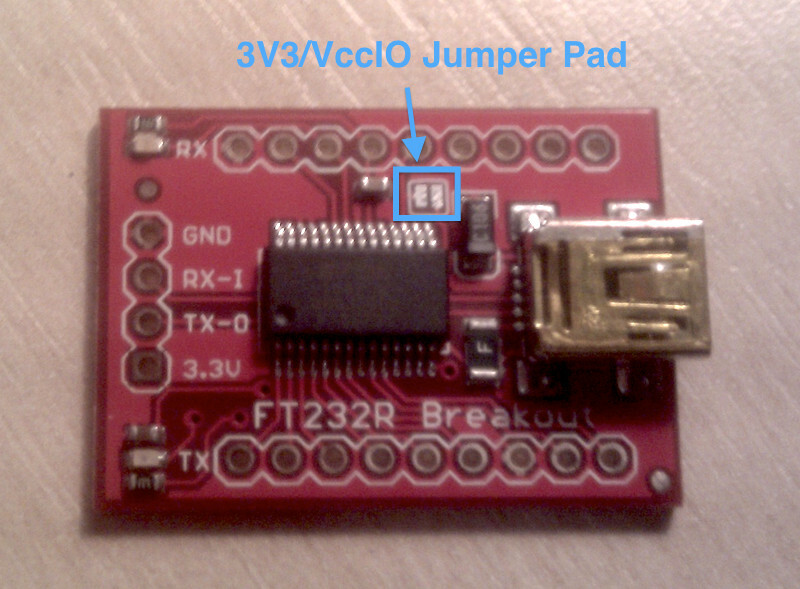 This is an excellent little tutorial for people who need to get the FT232 breakout to 5V IO. I'll link from the product page. Can anyone resurrect the picture / instructions for this mod please? Here's a (bad) picture of the board with the jumper blob freshly removed. Step 2 is connecting VccIO (breakout pin 15 - the one directly below the R in 'FT232R Breakout' silk screen in the image) to either VccUSB, or better, to some smoothed post-regulator Vcc as used by your application. If in doubt, see the data-sheet & schematics. I'm reading this post since I'd like to use this device with 5V and I'd like to know if I just have to unsolder the jumper and then to connect the pin 15 to a 5V power regulator or if I have to do something else. Unfortunately, I'm not able to see the picture attached to the first post. Do I have to connect anything on 3.3V pin? In order to use this device, I only have to connect GND, RX and TX pins to GND, TX and RX pins which are present in my circuit, then to unsolder the jumper and finally to connect the pin15 to my 5V voltage regulator which is present on my circuit without considering the 3.3V pin? what does it mean? I have to connect with a wire VCCIO pin to VCC? marcusbarnet, the VCCIO pin of the FT232RL chip is the supply voltage input for the serial input and output pins. The FT232RL is bus-powered from USB (VCC, 5 volts) and generates its own 3.3 volt supply from that (3V3OUT). If you check the datasheet for the FT232RL you'll see that it can work with VCCIO in the range 1.8 - 5 V.
In the version of this board now being supplied there are three solder pads which are connected to 3V3OUT, VCCIO, and VCC. As supplied, VCCIO is bridged to 3V3OUT so the I/O pins will run at 3.3 V. If you want them to work at 5 V, unsolder the bridge from VCCIO to 3V3OUT and solder VCCIO to the VCC pad instead. You don't need to supply the 5 V from your own regulator, and if you don't want to use the 3.3 V supply then don't connect anything to 3V3OUT. Or, if you want to leave yourself the option, unsolder the 3V3OUT bridge and then use a wire on your breadboard (as shown in the first picture) to connect VCCIO to your chosen I/O supply voltage. Thanks for this guys I've just successfully gone through this and it works (although my soldering is below par haha). Great tutorial, and contributions guys so thank you. Since many comercial sollution with FT232 chip has no support for 3v3 level, I make my own board that is configurable by jumpers. Also, embeded MAX232 chip and DB9 port is usefull for other devices with MAX232 (for example GPRS modems, eV. kits etc. My board has a date stamp of 4-16-2010 and the jumper pads don't look like those in this post. My board has three pads and it came with no solder jumpered between any of the pads (see picture). Connecting my ft232RL, as it came from sparkfun, to my breadboard arduino gave 3.3V on the TX/RX lines. After placing a small solder blob across the middle pad and the pad on the right (beside the "5"), the TX/RX lines then measured at 5V. I was getting "out of sync" errors in the arduino ide before doing this. Also, I didn't have to run a separate wire from vcc to vccio as shown in original post. Sorry if this is obvious to others, but it took me a little bit of time to figure this out. Hopefully this will help someone else. I bought this FT232RL adapter. How can I make it use 1.8V TTL levels for wiring Tx/Rx/GND to my phone's serial port? As I understand it, by default it works with 3.3 TTL. Yes! I too would like to know how to convert the 3.3 output to 1.8 volts. In my case, I want to power a GA144 without the extra 1.8v power supply (http://www.schmartboard.com/index.asp?p ... ted&id=195) described at: (http://www.greenarraychips.com/home/doc ... udget.html). Even their evaluation board can run off the USB bus power, without a wall wart, I just have no clue how to do it with just the SchmartBoard P/N 202-0048-02 (http://www.schmartboard.com/index.asp?p ... csp&id=532) and the FT232RL. TemplarKnight, to get the board to have 1.8V on the serial lines you need to do a few things. -Remove any solder bridge on the pads in the provided pictures which connect VCCIO to either 3.3V or 5V. -Remove the resistors in series with the LEDs for TX and RX (R1 and R2 going to LED1 and LED2, respectively, on the schematic). On the board they are right next to the LEDs and are marked with 331. This is due to internal 200k resistors on those inputs and the LEDs being tied to VCC. So that series circuit of VCC to R1/R2 to LED1/LED2 to 200k to VCCIO will always pull up the value on VCCIO to ~3V. If for some reason you really want the LEDs to work you can either just remove the side connected to VCC and wire that to VCCIO instead. Or you can load down VCCIO with a resistor to ground. I have found ~1.2k resistors work for this although some tweeking of the actual value may be required. Great, this post was essential to me getting this working for my application in 1.8v. In my case, I scribed the two lines leading into the resisters from Vcc, then added a pair of tails from Vccio to the base of the resistors. The indicators are a bit dim at 1.8V but certainly visible. Again, I would strongly encourage Sparkfun to revise this board replacing the indicator Vcc connection with one to Vccio, also possibly replacing the two color tx/rx leds with red ones that can still be more reliably driven with as little as 1.8V. The blue is barely perceptible at this voltage drop.